17-Year-Old Boy From Odisha Have Discovered A Way To Generate Electricity From Scrapped ₹500 Notes. With the country reeling from a cash crisis post-demonetisation, a 17-year-old science student from Odisha's Nuapada district has devised a technique to generate electricity from scrapped Rs 500 notes. His innovation has now grabbed national attention, with the PMO directing the state science and technology department to submit a report regarding the project. 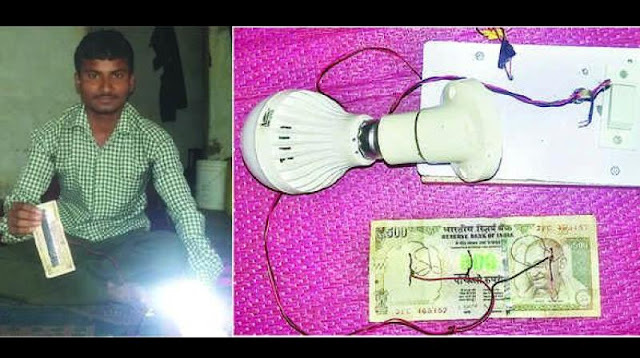 Lachman Dundi, a student of Khariar College, has claimed that he can produce up to five volts of electricity from an old Rs 500 note. So how does Dundi generate electricity from the currency notes? He uses the silicon coating on the note to create energy. "I tore up the note so that the coating is visible, which I exposed to direct sunlight. The silicon plate has to be connected to a transformer with an electric wire. This can help generate electricity," he said. On April 12, the PMO wrote to the state government to verify Dundi's claim. On May 17, the Odisha government directed the department concerned to study Dundi's project and send a report to the PMO.